Come, daughters, come out. I know you’re behind that bough- you stink of it, darlings. Come sit by the inferno, beneath my wing. Now, now, there’s nothing to fear; this neck of the woods is a haven. Don’t fear your new friends; I know they might look quite gruesome. Lucretia, darling, move over, and don’t get your blood on our guests. Here are our new members of the Sisterhood. I once was the wind. I kissed babies goodnight and left rude men to putrefy in their matchstick ships beneath the tropical sun. I helped the Israelites cross the Red Sea and cushioned Lucifer’s tumble from grace. My skin was slick with the blood of the lambs sacrificed in my name. I can hear them screaming still; I carried away their shrieks on my gentlest breeze and bottled them to pour in my bedtime gin. The needle of my moral compass spun like a weathervane and I was beautiful in my unbridled ugliness. But men can’t love a beautiful thing until they’ve put an arrow through its breast and a silver shackle on its finger. Men battled their natural mortality and my sisters and I were caught in their line of fire. We had our wings clipped, our bodies tarred and feathered. Harpies, they called us. And then they exiled us to barren islands or to Hell. But I was not a harpy, and I do not belong here in the woods. Take care of your ilk, they had told me. Take care of the hideous women who chose to collapse under rather than endure her master’s whip. Do you know why my girls are here? They didn’t take their own lives. They were stuffed inside a bag and drowned in a lake. Well, quite literally for dear Virginia. Lucretia was raped and chose to die rather than face the punishments they would’ve brought upon her. Sylvia, anchored to her home by her child, watched from the window as her love entered the bed of another woman and never reemerged. Marilyn had been choked to death with velvet ropes, and her bones were already white from all the peroxide treatments. They will sit in these dark woods with me forever, staring into the fire pit. Sometimes they will fall into a daze and think they see a glimmer of heaven, a righteous golden glow that dims in comparison to the spirit they had been born with. That’s where they belong, Paradise. And I, I belong back beneath sunlight and sky. I am a spirit, a force of nature. I do not operate under human laws, and I do not deserve punishment for fertilizing new life with the bodies of the old. And my little fledglings, they do not operate under the law of man. They are not commodities, they are not bejeweled nightingales who must stay awake to sing men to sleep. They do not deserve to be denied Heaven because men could not deny themselves of their fits of passion. And you. I am so sorry, my darlings. I am so sorry that you’re to be damned here with us. Centuries upon centuries have passed, and we still receive new inmates because the laws have yet to be changed. Come, sit. Warm yourself by the fire. In this prison you will have the most freedom that they will ever allow you. 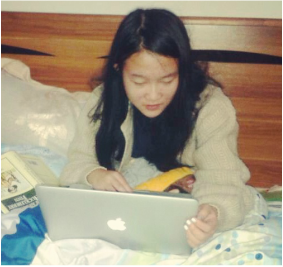 SOPHIE GU is still figuring everything out but knows for sure writing is somehow involved. She is a California Arts Scholar and has been recognized by the California High School Speech Association for her work in Original Prose and Poetry. Check out more of her writing at swgwriting.wordpress.com.